Kavadiyattam, a colorful ritual art, is a votive offering to Sree Subramanya. Basically of Tamil origin, Kavadiyattam is widely prevalent in the Subramanya temples all over Kerala during the festival seasons. Dressed in bright yellow or saffron robes, devotees performing kavadiyattam smear vibhoothi or sacred ash all over their body. 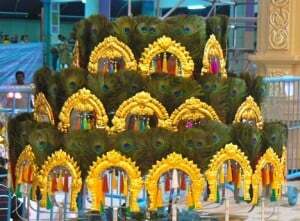 Each one carries on his shoulder an ornate Kavadi – a huge bow, richly decorated with peacock feathers, (it is believed that the peacock is the vehicle of Sree Subramanya). Kavadiyattam literally means dance carrying a kavadi. Kavadies are usually of different sizes and shapes, each with its own significance. A Pookavadi is one decorated with brightly coloured artificial flowers; a mayilpeeli kavadi decorated using only peacock feathers and ambalakavadi, one shaped like the gopuram (tower) of a temple. A kavadi can rise up to a height of 10-18 feet. The dancers twist and spin in a row. A group of such kavadi dancers make an exotic sight. The dancers gradually move in a frenzy, in step with the rising beats of percussion instruments like udukku, chenda etc., accompanying the procession. Sometimes nadaswaram, a wind instrument, is also used.